This stuff freezes well, it’s hearty, and you can adjust the heat level easily up or down, simply by adding more or less fresh habanero chile. The baseline heat level of the sausage is only warm, so if you want a real kick, add at least half a habanero to the pot. 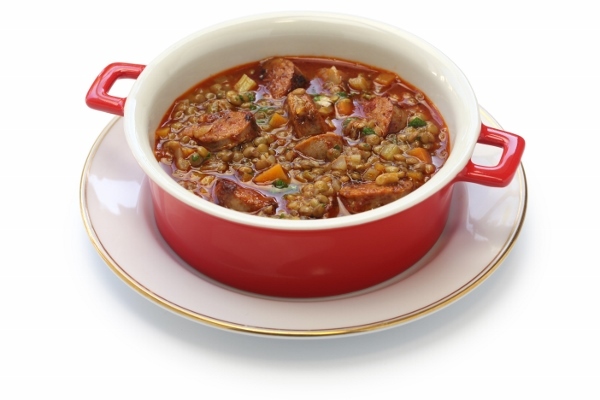 This features Mulay’s Killer Hot Italian Sausage, but you can use your favorite spicy Italian sausage. Heat a large 6-8 quart pot on medium heat. Add the bacon pieces and cook until browned. Remove the bacon pieces and set aside. Heat the remaining bacon fat and add the carrots, onions, celery, and cumin. Sauté until softened and onions begin to turn translucent. Add the garlic and habanero, and cook for another minute. 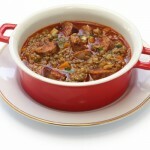 Return the cooked bacon to the pot and add the lentils, stock, water, thyme, bay leaf, salt, and pepper. Bring to a boil, then reduce the heat and simmer the stew, partially covered, until the lentils are tender—about 45 minutes. Brown the sausage links in a separate skillet over medium heat until they are cooked through. Remove from the pan and slice into bite-sized pieces when slightly cooled. Add the sausage to the stew during the last 10 minutes of cooking. Add the sherry vinegar and cilantro to the stew, and adjust the salt and pepper to taste.